Every late January to early February, Montreal's Parc Jean-Drapeau turns into a winter wonderland, a childhood delight that features activities for kids as well as for adults, though the festival's focus is on family, so much so that heated rest stops and a special baby centre with rocking chairs, nursing pillows, and microwaves are made available on site. The Fête des Neiges 2018 edition runs 10 a.m. to 8 p.m. every Saturday and from 10 a.m. to 5 p.m. every Sunday from January 20 to February 11, 2018. The festival is on WEEKENDS ONLY. It's free admission to access the site and several activities. Other activities involve modest fees. 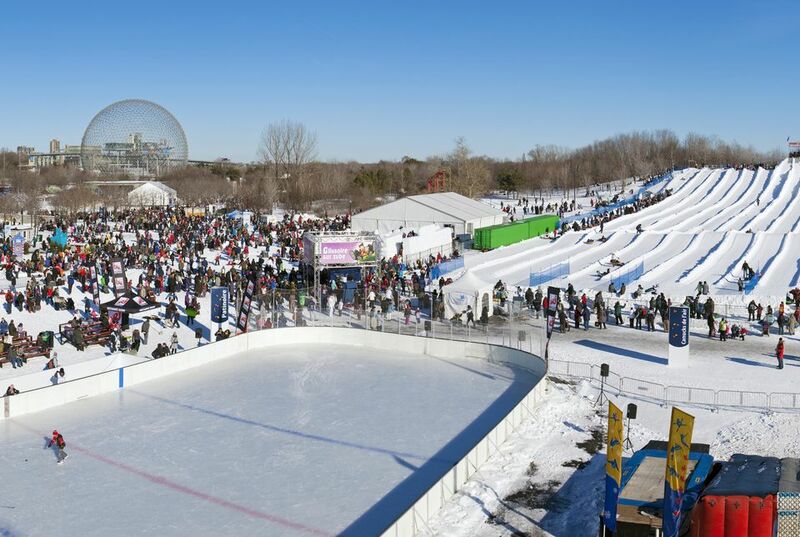 Every edition usually features ice sculptured playgrounds, a hockey tournament, inner tubing, sliding, skating, snowshoeing, special activities at the Biosphere and live shows. Special facilities for parents with infants are available as are lockers and spaces to warm up the kids. Food is also sold on the premises. As much as Montreal Snow Festival Fête des neiges is an accessible, free admission event, many of its activities are not and those extra fees add up quickly, which is why the ACCROPASSE is, in my opinion, the most affordable way for families to participate in as many activities as possible. It gives pass holders unlimited access to tube sliding, the festival zipline, the Biosphere and the Stewart Museum throughout the festival's duration. It also grants pass holders rebates on ice skate rentals, dog sledding, and food. The pass is $16 per person, free for ages 4 and under and a family pass costs $50 covering ACROPASSE privileges for 4 family members. The Montreal Snow Festival 2018 edition proposes new features as well as old favorites, highlights I'm convinced you and your kids are going to love. Some are free, some are not. Note that admission to the grounds themselves is free. Parking in Parc Jean-Drapeau costs extra. The big Polar Circus and its myriad shows are expected again in 2018 "with its colorful collection of characters. They'll need some help staging the exciting and hilarious acts that are filled with magic and surprises..." The circus runs frequently, on a loop, throughout the Snow Festival. I love this skating destination. Here's why. Note that admission is free. Ice skate rentals cost $12 for two hours, $9 for ACROPASSE holders. Lockers on location. Here's everything you need to know about booking a Montreal dog sledding session. Not recommended for pregnant women nor for tots and babies under age 2. Ages 2 to 5 must be accompanied by an adult. Fête des Neiges proposes a giant ice boat complete with live captain for families to discover. See if you and your family can find the way out of Fête des Neiges' labyrinth in the woods. Hop on a kicksled and race your children to the finish line. What's a kicksled? It's basically a dog sled without the canines. The parent basically does the sliding instead. New in 2018. Guided by a Stewart Museum staffer, go on a free snowshoe tour of British military vestiges in the park every Sunday of the festival. Discover more 2018 Fête des neiges highlights at Parc Jean-Drapeau right here. And for a complete list of Montreal Snow Festival activities, consult the Fête des neiges website. Getting to Parc Jean-Drapeau's Fête des neiges by car is feasible: factor in a parking fee ranging from $4 an hour to $20 per day. It's also easy to get to the hub of site activities using public transit. Fest organizers propose attendees take advantage of special parking areas near Namur, Radisson, Montmorency, Angrignon and Longueuil metros in order to take the the subway, getting off at Metro Jean-Drapeau for direct access to snow festival grounds. As for public transit fares, families benefit from a Family Outings promotion, whereby parents, after paying their own transit fare, can bring along up to five kids ages 12 and under for free on weekends and during legal holidays. Find out more about Montreal public transit transit fare rates. Visit the Parc Jean-Drapeau website for details. Call (514) 872-6120 for further assistance.